Hold back your hadouken: Capcom finally spills the details on the mysterious handheld version of Super Street Fighter IV. Super Street Fighter IV 3D Edition was certainly one of the stranger 3DS announcements to emerge from Nintendo's E3 conference in June. In an interview with Japanese magazine Famistu this week, Capcom producer Yashinori Ono has finally dished out details on the game, answering questions on the gameplay, the use of 3D, and what changes had to be made to force the fighting game onto a handheld system. 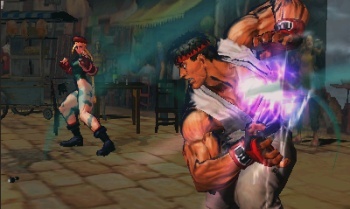 "The gameplay will be the same as Super Street Fighter IV," Ono assured readers. Famitsu backs him up, running a series of screenshots in the same issue confirming that all of the fighters and gameplay systems are in place. Ono stated that his team isn't quite sure yet how they will utilize the system's three-dimensional capabilities, but the producer was adamant that the 3D would not be a part of the gameplay. He does not want to allow players to drop into and out of the 2D backdrop or do anything else that would affect competitive play. Later in the interview, he mentioned that they might use the 3D for the game's visual effects. While the core gameplay will remain the same as its Xbox 360 and PlayStation 3 predecessors, the move to the 3DS will require a few control changes. The team is experimenting with adding additional buttons to the touch screen and placing certain special moves on the analog slide pad. Famitsu asked Ono whether the game would be altered for a younger audience, by nature of it appearing on a Nintendo-produced piece of hardware. Ono was firmly against this, stating, "Rather than that, we'd like to make it into a title that makes kids grow." All of this leaves one question, why choose the 3DS? When asked this, Ono replied that the PSP and DS were not powerful enough to reproduce the game at an acceptable level, and that the 3DS would finally allow the team to make something that "showed the enjoyment of having Street Fighter in your palm." He also noted an interest in using the system's extended wireless capabilities for multiplayer matches. Famitsu listed Super Street Fighter IV 3D Edition as hovering around 10% complete. While the game will likely not make it out in time for the system's launch, Ono would said that he'd like to release the game shortly after the arcade version's release, when things are heating up for the franchise again.